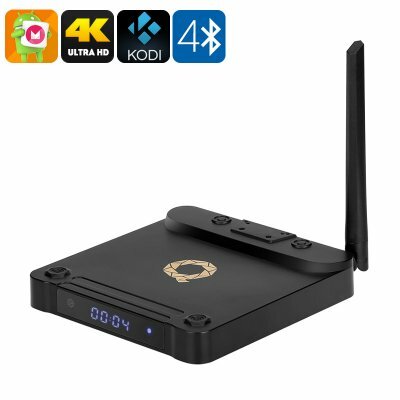 Successfully Added HIFIXPLAY Android 6.0 TV Box - 4K Resolution, Google Play, Kodi TV, Miracast, Airplay, Amlogic S912 CPU, Dual-Band Wi-Fi to your Shopping Cart. An Android 6.0 TV Box is the perfect little smart home gadget for all the people who have ever dreamt of having their own private cinema and entertainment system. Turn your regular TV into a smart TV and enjoy a true cinematic experience by viewing the latest movies and series in ultra-HD 4K resolution from the comfort of your own living room. Additionally, with its Android 6.0 Operating system this HIFIXPLAY TV box allows you to browse the web, stream online content, and download the latest apps and games that can be played right from your big screen tv. Featuring a Quad-Core Amlogic X912 CPU that has been clocked at 2GHz along with 2GB of RAM this Android TV box features some serious hardware that is capable of running the latest 4K movies and most demanding games without dropping a frame. Its ARM Mali-T820MP3 GPU additionally provides you with the purest and sharpest graphics out there, letting you enjoy all your media to the absolute most. With 16GB of internal storage and up to 32GB of external memory this Android 6.0 TV box offers you plenty of space for all your games, media, files, and more. Coming with both Google Play and Kodi TV installed this home entertainment kit provides you with free access to millions of the latest movies and games out there. Its Miracast feature gives you the possibility to mirror your smartphone’s, tablets, or PC’s display straight onto your TV monitor without the need of any cables, thus letting you enjoy all your mobile devices have to offer on a big screen TV. Additionally, its airplay feature allows Apple users to synchronize their iOS devices with this Android TV box in the same manner as if they were using Apple TV – making this the perfect Smart Home accessory no matter whether you’re using Android or iOS. With its Dual-Band Wi-Fi connectivity this Smart TV Box provides you with the fastest data speeds out there. Browse the web and stream the latest movies without experiencing any delay - or download movies and games in the blink of an eye – with this Android 6.0 TV box slow internet connections are an issue of the past. Whether you use it to watch the latest 4K movies, your favorite series, browse the web, or play online games – this TV box is the perfect Smart Home accessory that is guaranteed to bring years worth of fun and entertainment into any household or office alike. The HIFIXPLAY Android 6.0 TV box comes with a 12 months warranty, brought to you by the leader in electronic devices as well as wholesale electronic gadgets..